European Senior Chess Championship 2017 took place in Sabadell, Spain from 11th-21st August. The Championship was played in two different age categories: 50+ and 65+. The separate Women’s Championship was organized just for the 50+ category, while women 65+ played in the Open section. 129 players coming from more than 20 European federation participated the event, including 10 GMs, 10 IMs and European and World Chess Champions. European Youth Team Chess Championship 2017 took place in Rymanów Zdrój, Poland from 16th till 24th of August 2017. 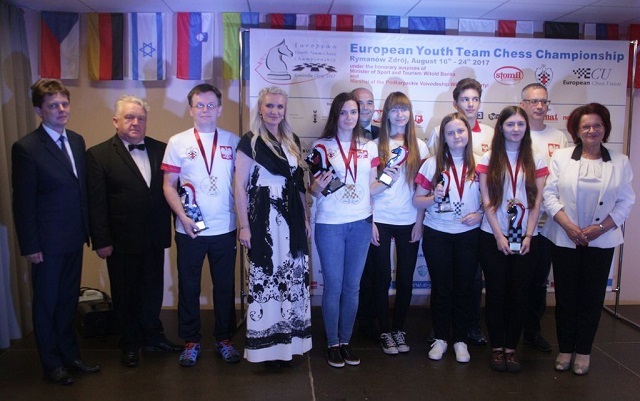 German team became the winner in Open Section and Polish team won Girls Section of the European Youth Team U-18 Chess Championship 2017. The Championship featured 40 teams coming from 16 countries which is a new participation record! The first place in both sections was under the question until the end of the last round of the Championship. Germany shared the first place with Serbia. Both teams scored 11 match points, but thanks to the better tie-breaks, Germans finished with gold in their hands while Serbia took silver. Third place went to Croatia with 10 match points. Poland I, Slovenia II and Estonia teams finished the championship with the same number of match points - 10, but according to the tie-breaks system, Poland I became the European Youth Team Champion for 2017, Slovenia II ended second and Estonia took bronze. The event was organized by PST “Stomil” Rymanow Zdroj and Polish Chess Federation, under the auspices of European Chess Union. Organizers provided very nice playing conditions and for observers an impressive live coverage. All the games were transmitted live, and some of them commented by GM Bartlomiej Heberla and GM Marcin Tazbir. Beside that, live video during the games showed the real spirit from the playing hall. The 2017 Asian Club Champions League was organized by Chess Federation of Sri Lanka under the patronage of the Asian Chess Federation, started in Citrus Hikkaduwa, Sri Lanka. The championship was played as a Swiss System team tournament. Trophies, medals and certificates were awarded to the top three teams. A total of $10,000 cash prizes were awarded to the top three participating clubs, with the top-ranked squad receiving $5,000. The second- and third-placed teams got $3,000 and $2,000 respectively. Iran’s Saipa Chess Club finished first in the continental sporting event. 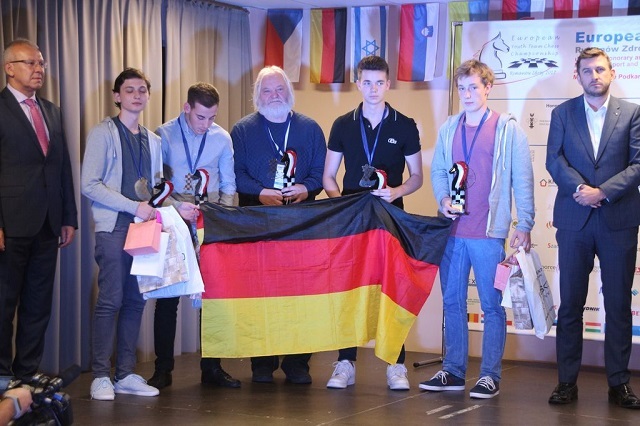 Saipa Chess Club also secured a spot at the 2018 World Team Championship in Radebeul, Germany. Ehsan Ghaemmaghami, Masoud Mosadeghpour, Amin Tabatabaei and Amir Rezapour were members of the Iranian squad. They were under the tutelage of Morteza Mahjoub and supervised by Masoud Namvari. Saif Sporting Chess Club from Bangladesh, Australia’s Sydney Chess Club Australia, Bai Xue Qi Yuan of China and the Sri Lankan Team occupied the second to fifth positions. Zone 4.3 U16 Youth Team Championships was held from 4th to 12th August 2017 in Maputo, Mozambique. Each delegation consisted of 3 boys and 2 girls. The event took place at Hotel Residential Kaya Kwanga and team B of Mozambique became the winner. The start of the event had great setbacks, 14 countries were officially invited by the African Chess Confederation. Of which five confirmed their presence, respectively, Angola, Swaziland, Zambia, South Africa and Mozambique as a host. For administrative reasons, Angola, South Africa and Zambia cancelled their participation over time. Mozambique participated with teams A, B and C and together with Swaziland made up 4 teams. 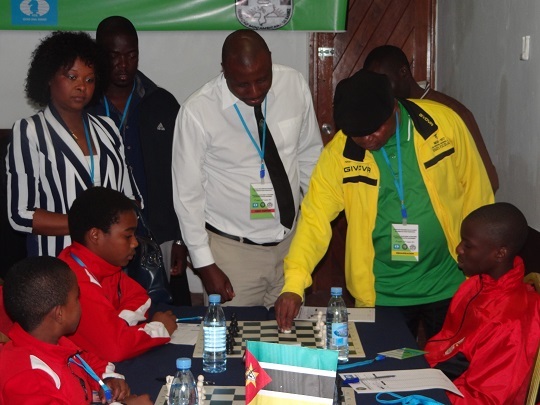 The event was attended by the entire board of the Mozambican Chess Federation, including administrative staff and third-party services. 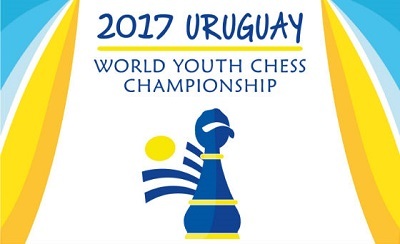 FIDE World Youth U14, U16 & U18 Chess Championships 2017 (open and girls) was held in Montevideo, Uruguay, from 16th of September (arrival) until 26th of September (departure) 2017. The Championships were organized and held under the auspices of the Uruguayan Chess Federation (FUA), the Confederation of Chess for Americas (CCA) and the World Chess Federation (FIDE). FIDE World Cup was held from 2nd to 27th of September in Tbilisi, Georgia. Levon Aronian from Armenia became the winner after beating Ding Liren from China in the final. 128 player Knock Out tournament brought together the strongest players in the world, and had an impressive prize fund of 1.6 million US dollars. Participants included the World Champion and number one in rating list Magnus Carlsen, three former World Champions Viswanathan Anand, Vladimir Kramnik and Ruslan Ponomariov, the winner of the previous World Cup in Baku, Sergey Karjakin. The participation of the 15 top players made this event the strongest World Cup in history. European Youth Chess Championship 2017 was held from 4th to 15th of September in Mamaia, Romania. The Championship was played in 6 age categories: U8, U10, U12, U14, U16 and U18, open and girls sections. 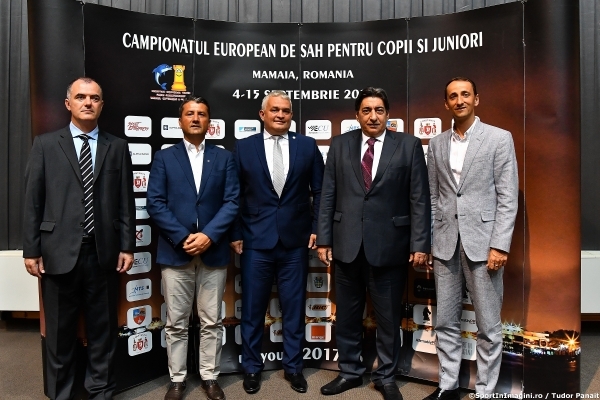 The opening ceremony was attended by the ECU Secretary General Mr. Theodoros Tsorbatzoglou, ECU Deputy President Mr. Ion Serban Dobronauteanu, the FIDE Deputy President Mr. Georgios Makropoulos, the President of the Romanian Chess Federation Mr. Sorin Iakoban, the Mayor of Constanza Mr. Decebal Făgădău and the President of the Romanian Olympic Committee Mr. Mihai Covaliu. The organizers provided live broadcast of 90 games which can be followed through the official website of the Championship or through the ECU website. This year the event attracted 1142 players and young stars, among them 215 titled players, 1 GM, 16 IMs and 2 WIM The event was organized by Romanian Chess Federation, “Mind Games&Events” Sports Association under the auspices of European Chess Union. European Universities Chess Championship 2017 as held in Fuengirola, Spain from 18th till 24th of September 2017. Over 120 participants representing 25 Universities from 15 countries took part in the European Universities Bridge & Chess Championships 2017. The event, which started with the General Technical Meetings on September 20 and competitions the day after, showed high level of bridge and chess, and the participants excelled not only in mind sports, but also in physical activity. Women Team Competition in chess was over on Friday, with Ural State Mining University (RUS) being first with 9 points, University of Belgrade (SRB) second with 7 points, and University of Physical Education (HUN) third with 6. Last three rounds in Open Team Competition were held on Saturday afternoon, with Russian and Serbian teams fighting for the gold medal. At the end, Ural State Mining University (RUS) brought home gold also in men’s category, with the University of Belgrade (SRB) as runners-up. A tight fight between Open University of Israel (ISR), AGH University of Science and Technology (POL) and Poznan University of Economics and Business (POL) for the bronze medal ended with the Israeli making it to the podium. Asian Cities Chess Team Championship (DUBAI CUP) 2017 was held 25 August – 02 September, 2017 in KIIT University, Bhubaneswar, India. The top seeded Iranian team Rasht registered a convincing 4 – 0 victory over Dubai in the final round to clinch the Dubai Cup for Asian Cities Chess Championship with 16 match points here at KiiT University on Friday. Host Bhubaneswar with 14 match points finished as runner up after settling for a draw with Puri in the final round encounter while Dhaka finished third with 13 match points after defeating Muscat. The first edition of Asian Championship for Disabled kicked off in Bishkek, Kyrgyzstan, on September 14, and wrapped up on September 22, 2017. The tournament brought together more than 100 male and female chess players from 10 Asian countries, namely Afghanistan, Bhutan, India, Iran, Kazakhstan, Kyrgyzstan, Mongolia, Pakistan, Turkmenistan, Uzbekistan, and one oceanic nation Australia. 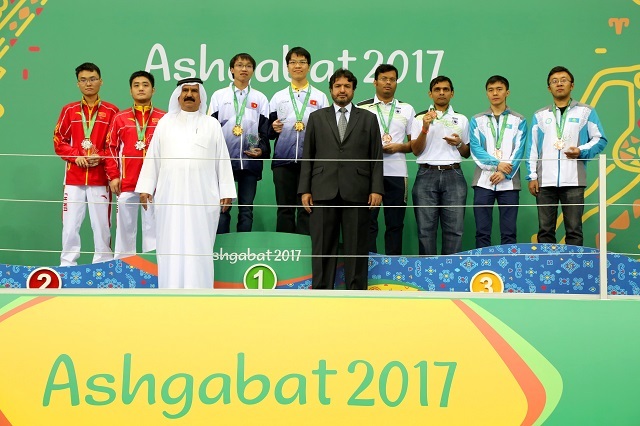 China won five gold and six silver medals to dominate the Asian Indoor and Martial Arts Games held 21-28 September 2017 in Ashgabat, Turkmenistan. 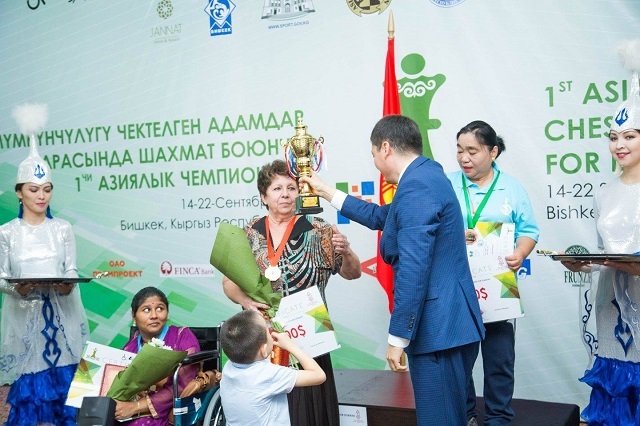 The multi-sport competition was organized by the Olympic Council of Asia in cooperation with the Asian Chess Federation and Turkmenistan Chess Federation. Vietnam followed in second slot with three gold, one silver medal and two bronze medals. Iran won one gold and one silver while Kazakhstan won one gold and three bronze medals. The Philippines won one silver and two bronze while Indonesia won one silver and one bronze medal. India won five bronze medals, Turkmenistan three while Qatar and Uzbekistan won one bronze each. Competitions were held in Standard chess for individual championships and Rapid and Blitz for open and under-23 teams. Download games and see round by round results in chess-results.com.